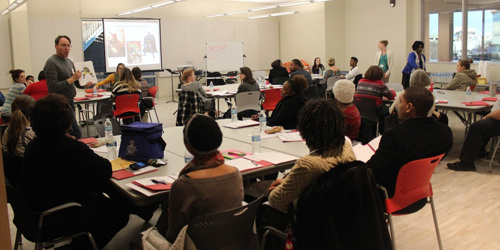 The Orpheum Theatre Group is excited to bring Kennedy Center teaching artists to work with teachers across the Mid-South. These arts integration specialists provide educators with the tools and strategies to transform classrooms. Arts integration, as defined by the Kennedy Center, is “an approach to teaching in which students construct and demonstrate understanding through an art form." Through this model, arts integration engages students so that they may construct and demonstrate their own understandings of core subjects through the arts, which increases literacy, raises test scores, and helps to develop key communication skills. In short, arts integration is a way to make learning fun whilst creating more enthusiastic, creative, and empathetic students. Throughout the year, the Orpheum Theatre Group brings in local professionals to guide teachers through the ins and outs of theatre. From creating a season of high school theatre to managing what goes on behind the scenes, these workshops will give educators the tools they need to bring theatre to life for their students.